This trail is extremely long and therefore I would rate it as difficult, due to the length. But, this trail is also pretty mild in that there are only two sections that have a big incline, but requires nothing technical. That’s why I would say moderate. If you’re an advanced hiker – you would probably find this moderate. 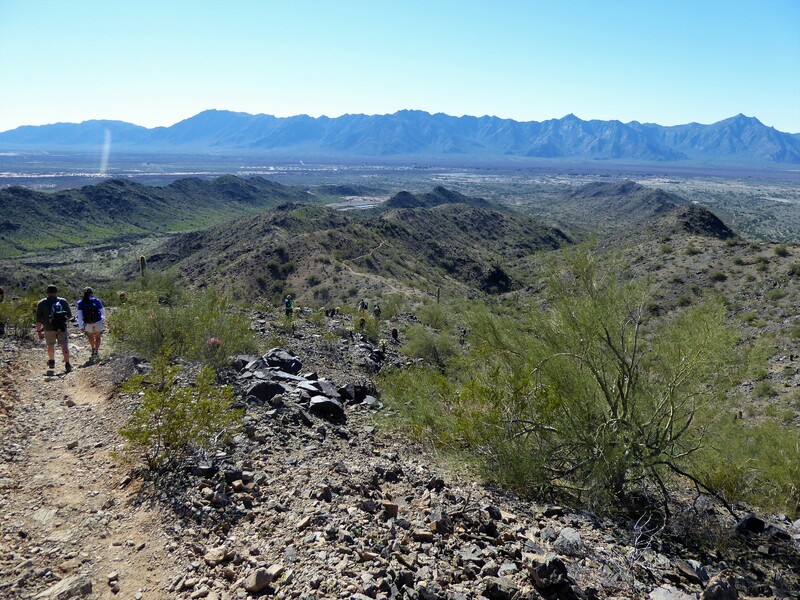 The National Trail is the main artery that runs through South Mountain in Phoenix, Arizona. All other hiking trails along this range will lead you to this alluring beast of a trail. 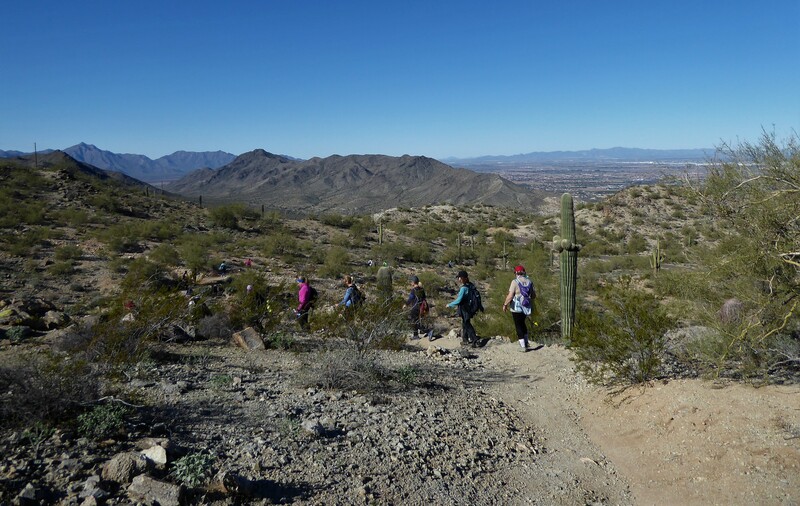 In 2012, the Phoenix New Times listed National as the Best Hiking Trail in Phoenix and it’s no doubt that this hike isn’t just average, it’s a complete adventure. 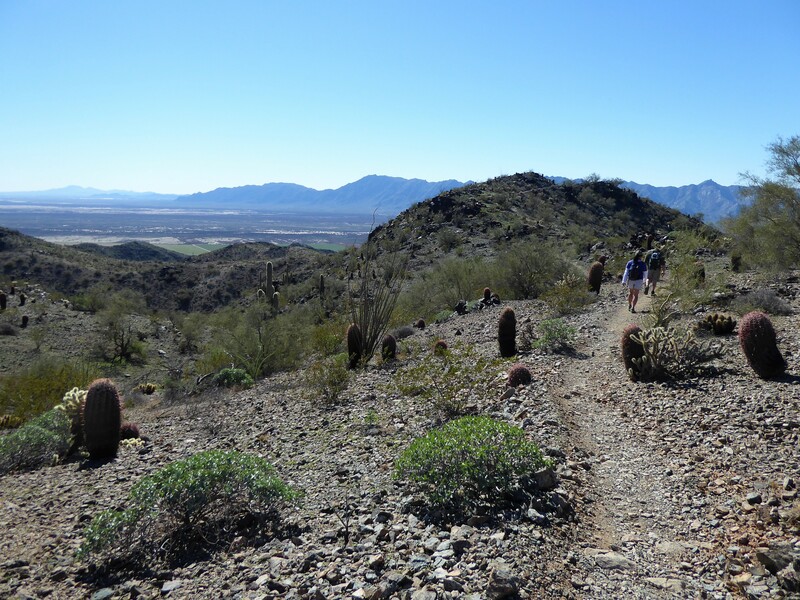 This gorgeous trail exposes you to the evolving desert landscapes of the entire mountain. The scenery in the beginning will be a completely different sight at the end. However, there is a down side to this trail. 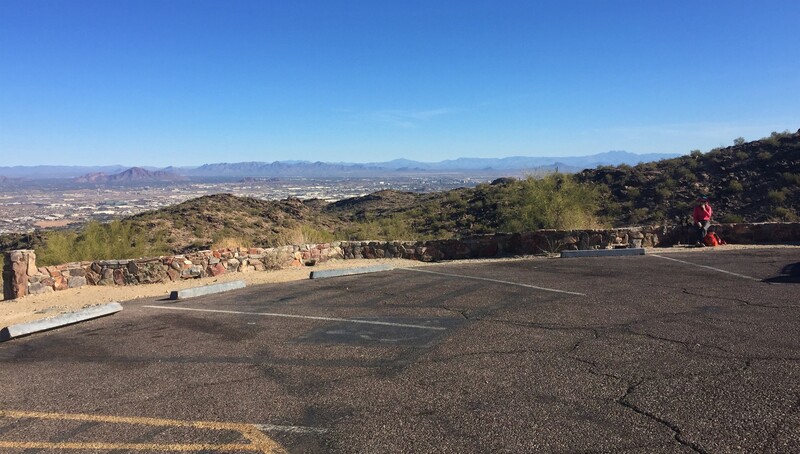 The road leading to the trail-head on the Western end of the mountain, is typically closed off to motorized vehicles. The only time the park allows cars to drive on it, is the first weekend of the month. Therefore, this limits the trails accessibility unless you wanted to hike this trail roundtrip, making it a total of 30 miles. This trail is intended to start from the East side of the mountain and move along towards the West. 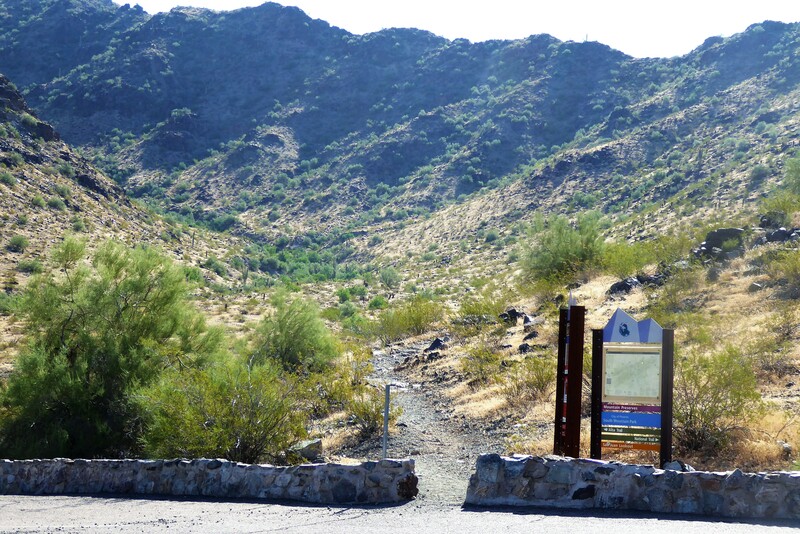 This would mean that you will start the trail from the Pima Canyon trailhead and walk close to a mile along the dirt road. Towards the end of the dirt road it will split and you will want to stay towards the right where you will see a sign directing you up to the trail. 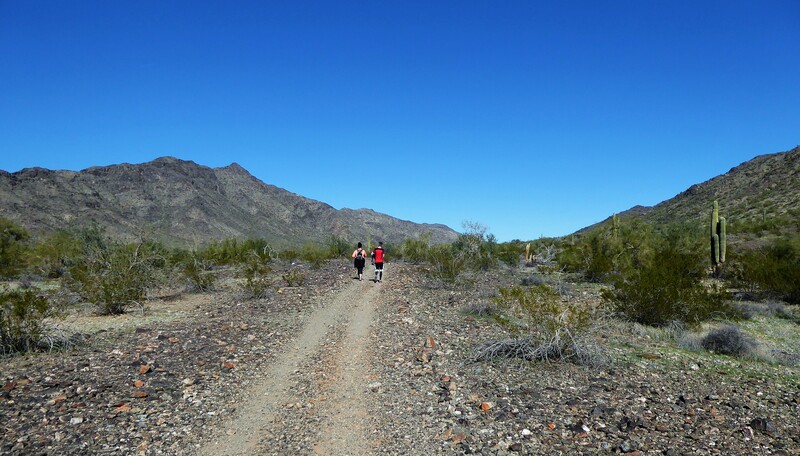 National Trail begins by taking you deeper and higher into the mountain range by gradually inclining and curving around the edges of the mountain. Throughout the entirety of this hike, this beginning part will be the hardest because it will be the longest ascent towards the top of the mountain. For all that hard work of going up, the view keeps getting better as more of the inner mountain views are exposed. 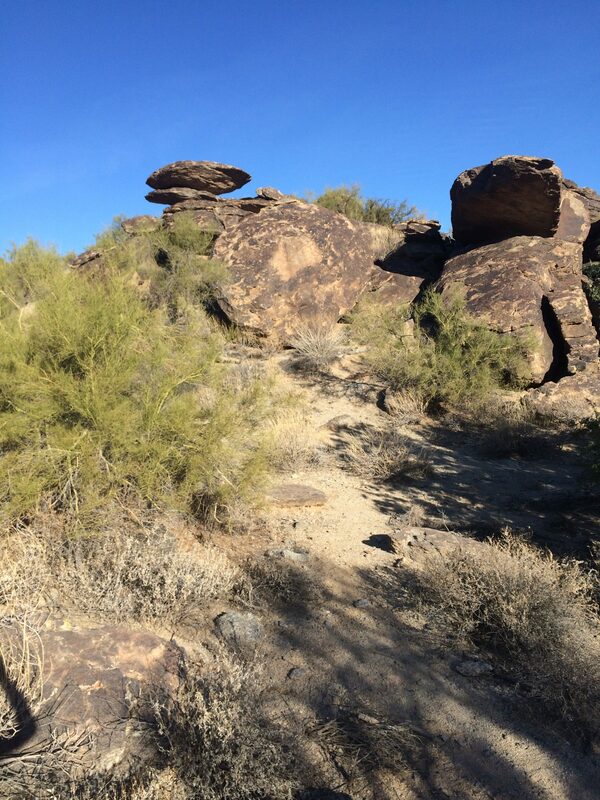 Once on top of the ridgeline, the trail begins to flatten out and the adventure really begins! From here you will see unique rock formations shaping up around you. Boulders delicately placed and leaning upon each other for support. It seems like at any moment, these heavy rocks could just easily slip away from each other and roll down the mountain. 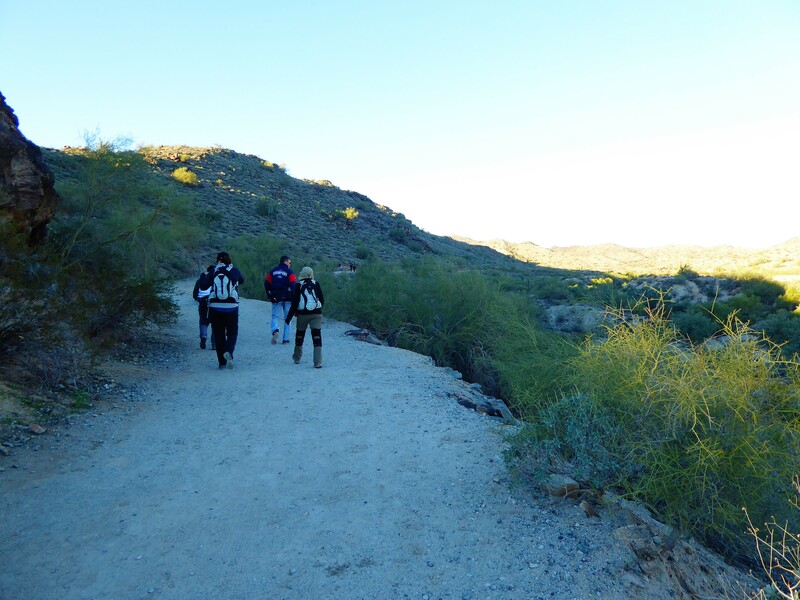 You will stroll through wash areas and pass Fat Man’s Pass from the secluded Hidden Valley trail. 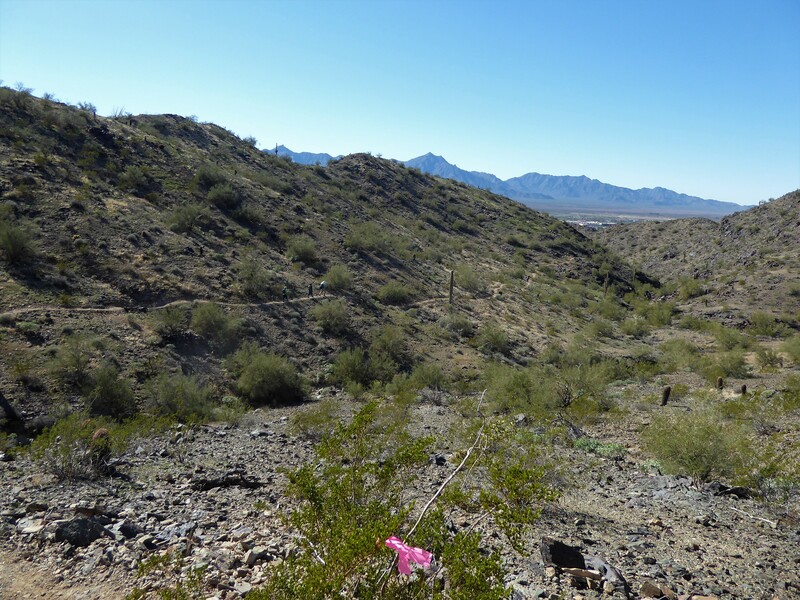 For a while you might even forget that you walking along the top portion of South Mountain. 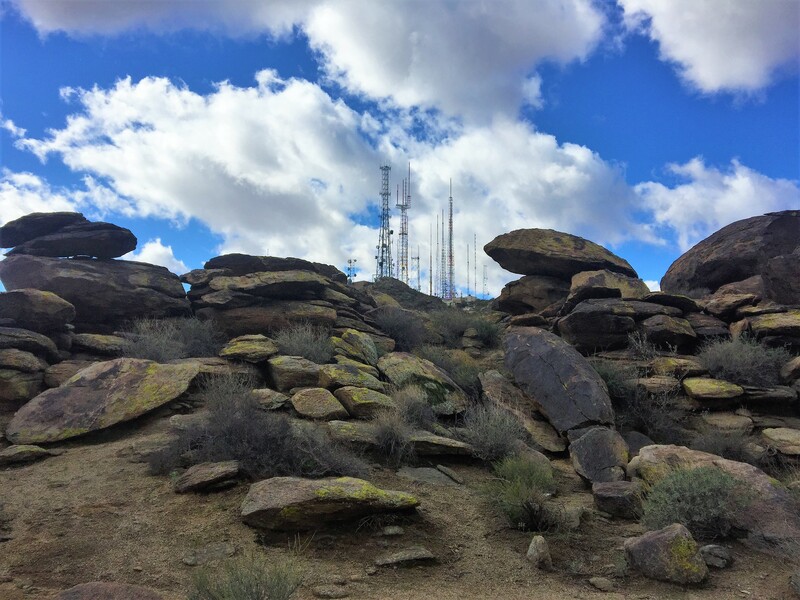 As you pass by the highest elevation point where you will see the towering antennas, the trail will begin to descend down until you reach the 7-mile mark at Telegraph Pass. This is the halfway mark and a good spot to take a break and eat some lunch. As you continue, follow the trail signs and make your way back up towards the Western end of the mountain. It is here, at this point that you will notice the shift in the terrain. The mountain now seems a little bare and rugged compare to the previous section. Gone, are the rock formations and are now replaced with sleeker rocks and the rolling hills with more green vegetation. It’s a lot quieter on this side and a lot less people as well. 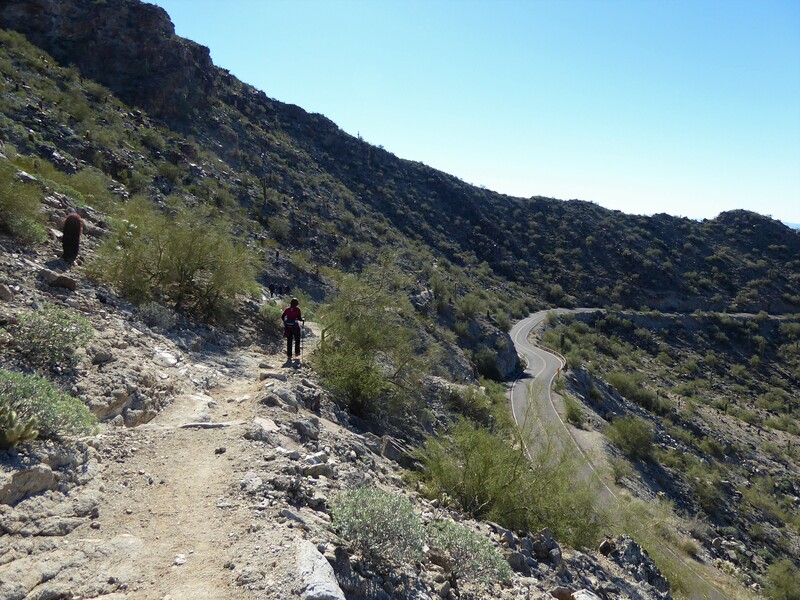 As you approach the top of the ridgeline, you will mainly be following along with the rim until you make the final descent down. As the mountain peaks rise up and then sways down, you will be following it’s path. The route will curve further to the West and the view of those mighty antennas you had previously passed will disappear behind you. 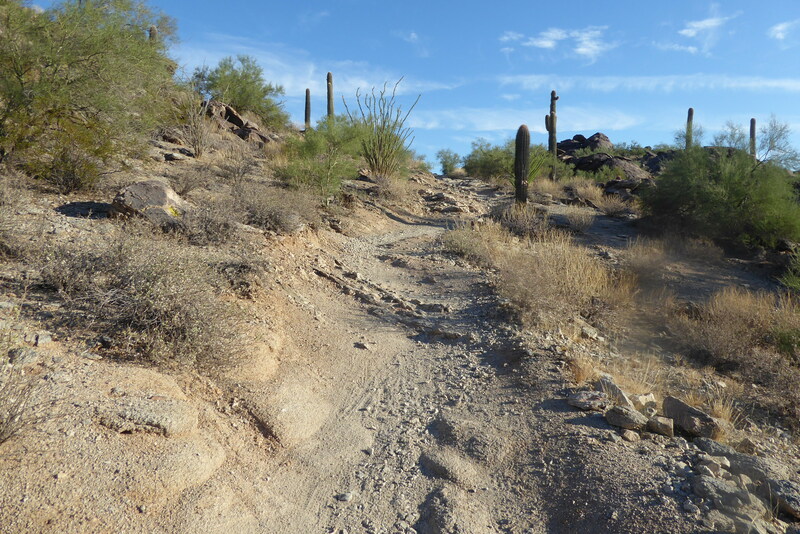 As you approach the 12-mile marker, the trail is now back onto the desert ground and you will be following this flat path until you reach the end at San Juan Lookout. Once at the lookout you are at the end of National Trail! 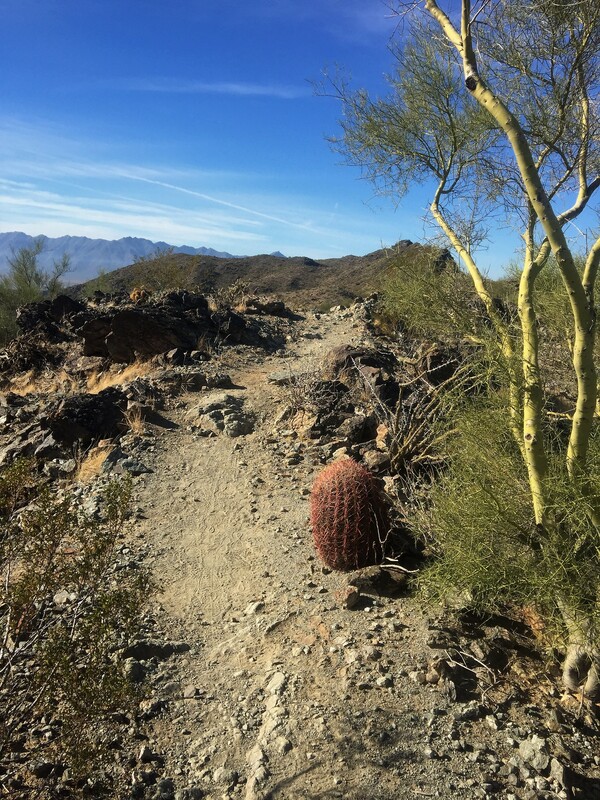 Be sure to bring along a congratulatory treat for yourself in honor of completing the longest hiking trail along South Mountain! While a lot of hikers have and will be on this mountain, only a select few can say they’ve hiked the entire trail.